The future of the 'Time for Heroes' band – who came together for a handful of reunion shows last year - looks bleak as the volatile relationship between the two frontmen is preventing them from having a full scale reunion. In new documentary film 'There are no Innocent Bystanders', Pete says of his bandmate: "He doesn't trust me and hasn't trusted me for a long time, and as far as I can tell it's too late to do anything about it." Carl understands Pete – who was sacked from the band in 2004 due to his drug use, with the band briefly continuing without him before splitting the same year - is upset at what happened between them but is adamant his mistrust is unfounded. He added: "Pete, for understandable reasons is still very hurt about what's gone on. And I believe he doubts my love for the band and for all of it." When asked if this was true, Carl replied: "No, it's really silly, and I wish he wouldn't. I am hurt by it. It's difficult." 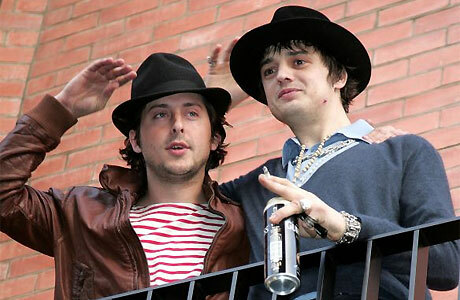 Since the band - which also includes John Hassall and Gary Powell - split in 2004, Pete has formed another group, Babyshambles, and released a solo album, while Carl found success with the band Dirty Pretty Things before releasing a solo LP last year.